We have water! 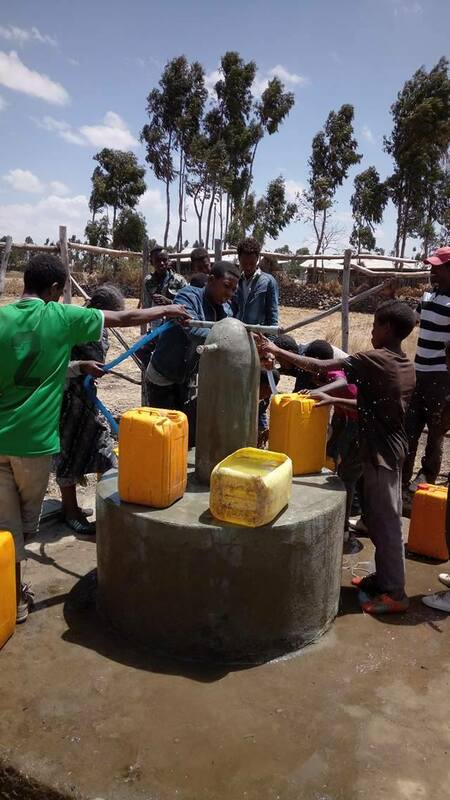 Children can now be seen gathering and socializing around their new favorite spot in the village…a deep water well. These children used to have to walk for hours every morning to fetch water from a dirty pond. They were often late to school or could not attend because the trek was too far and water-borne illness was prevelant. Now, they gather at ENA’s deep water well every morning to quickly fetch clean water and say hello to their friends before school. Balchi, Ethiopia is a rural village located 50 kilometers from the capital city of Addis Ababa. There are 6,000 people living in Balchi and another 7,000 in the surrounding villages who have never had access to clean drinking water. Your generous contributions have allowed us to change that and we are pleased to announce that all 13,000 people living in and around Balchi have access to clean drinking water for the first time. That means 13,000 lives will be forever changed because you cared enough to join the cause. The video below was taken the moment water reached the well. Once we knew all systems were working, we could build the faucets around it. Villagers will access clean, fresh drinking water near their homes with just the turn of a faucet! For many of us, this is something we have come to expect and easily take for granted. For these villagers, obtaining water has been a long, grueling daily chore that took hours. Moreover, the water they did collect was dirty, disease-ridden and unsafe to drink. The reservoir (pictured below) sits on a hill between the villages and stores clean water until needed. Villagers access water from faucets located at the bottom of the hill. A generator is activated when the water level in the reservoir falls below a certain level-pumping fresh water into the holding tank. The structure (pictured below) is built to protect and house the generator that pumps water up into the reservoir. Once the second phase of the well is complete, an assigned villager will monitor the generator and give regular tune-ups. ENA staff and local villagers work to dig trenches that will house the pipe systems on either side of the hill. One side is complete and the other will be completed soon. Below is the deep well that we completed during the first phase of the project. It is 200 meters under ground and the source of the clean water that is pumped up into the reservoir. There are also faucets that allow direct access to clean water. This one well will change the lives of 6,000 people and their families for years to come. The second phase of this project will provide water to another 7,000 people. Once this project is complete, the villages will have full ownership of the well. They will then select a water committee to protect and maintain the reservoir, generator, and faucets. The villagers will all pay a small fee each month to cover the ongoing costs. We are thrilled at the progress of this well and know that the benefits of clean water will be extensive and far reaching. Almost every aspect of their lives will be improved with this one basic need. Thank you to the Watkins family and everyone who made this project possible. Words can’t express our appreciation and the villagers’ gratitude for bringing hope and clean water into their lives. Thank you to everyone who has provided continued support for this project. If you would like to help fund a water project or learn how you can help, please visit us here! Thank you.